Today, I want to type about yet another one of my projects! Postcards! My new goal is to write at least one postcard every day. And so far, so good; I usually write two or three in the evening. I'm trying to get through the huge pile of "Sept" postcards that I'm sending to everyone in my address book. 51 postcards! whee! I've been working on this for three weekends now! I don't work on this crazy task every day tho... There are swap-bot trades and other pc exchanges. And there are just random postcards I feel the need to write! All these postcards I send make me incredibly happy! So many people think that snail mail is dying... but it's not! 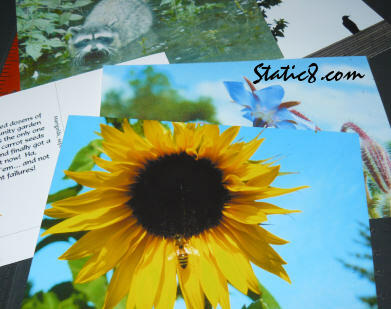 PostCrossing and Swap-Bot are just the more popular sites for snail mail exchanges! There are loads of smaller postcard and pen pal and mailing sites! ∞ Keep sending mail for FUN! ∞ Love your postal workers! ∞ ???! talk to your gov representatives? sign petitions? do democratic things?